What will be the likely impacts of climate change on water resources and productivity in the Mekong basin? This short term, integrated assessment of water resource response to climate change has identified critical regions and issues, and provided a basis for future in depth analyses, targeted at developing solutions and potential adaptation strategies. This study investigated how the climate is likely to change in the Mekong Basin by 2030, and quantified the uncertainty around future climate projections. The research provided a preliminary assessment of the potential impact of these changes on water resources and productivity. In summary, key impacts under future projections for climate and population in 2030 include; increasing flood risk, increases in food scarcity and likely changes in the productivity of fisheries through hydrological impacts on the ecology of rivers, waterbodies and floodplains. 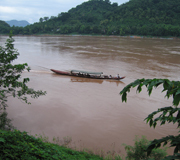 Our study has indicated some very significant impacts of climate change on the Mekong Basin. These include an increased frequency of extreme flood events, likely impacts on capture fisheries, a critical food source in parts of the basin, and increasing irrigation requirements in some regions. Per capita productivity is also likely to decline across the basin, with some regions more likely to be affected by food shortages than others. Early identification of these potential impacts will allow further in depth analyses of the issues, so that strategies may be developed and aid funds targeted appropriately to mitigate any adverse effects.